(Nanowerk News) With the flick of a light switch, researchers at the Salk Institute for Biological Studies can change the shape of a protein in the brain of a mouse, turning on the protein at the precise moment they want. This allows the scientists to observe the exact effect of the protein's activation. The new method, described in the October 16 issue of the journal Neuron ("In Vivo Expression of a Light-Activatable Potassium Channel Using Unnatural Amino Acids"), relies on specially engineered amino acids – the molecules that make up proteins – and light from an LED. Now that it has been shown to work, the technique can be adapted to give researchers control of a wide variety of other proteins in the brain to study their functions. "What we are now able to do is not only control neuronal activity, but control a specific protein within a neuron," says senior study author Lei Wang, an associate professor in Salk's Jack H. Skirball Center for Chemical Biology and Proteomics and holder of the Frederick B. Rentschler Developmental Chair. From L to R: Salk scientist Lei Wang and graduate student Ji-Yong Kang. If a scientist wants to know what set of neurons in the brain is responsible for a particular action or behavior, being able to turn the neurons on and off at will gives the researcher a targeted way to test the neurons' effects. Likewise, if they want to know the role of a certain protein inside the cells, the ability to activate or inactivate the protein of interest is key to studying its biology. Over the past decade, researchers have developed a handful of ways of activating or inactivating neurons using light, as part of the burgeoning field of so-called optogenetics. In optogenetic experiments, mice are genetically engineered to have a light-sensitive channel from algae integrated into their neurons. When exposed to light, the channel opens or closes, changing the flow of molecules into the neuron and altering its ability to pass an electrochemical message through the brain. Using such optogenetic approaches, scientists can pick and choose which neurons in the brain they want turned on or off at any given time and observe the resulting change in the engineered mice. 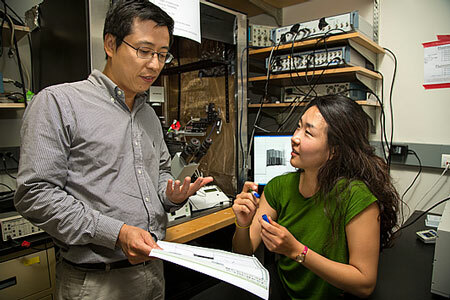 "There's no question that this is a great way to control neuronal activity, by borrowing light-responsive channels or pumps from other organisms and putting them in neurons," says Wang. "But rather than put a stranger into neurons, we wanted to control the activity of proteins native to neurons." To make proteins respond to light, Wang's team harnessed a photo-responsive amino acid, called Cmn, which has a large chemical structure. When a pulse of light shines on the molecule, Cmn's bulky side chain breaks off, leaving cysteine, a smaller amino acid. Wang's group realized that if a single Cmn was integrated into the right place in the structure of a protein, the drastic change in the amino acid's size could activate or inactivate the entire protein. To test their idea, Wang and his colleagues engineered new versions of a potassium channel in neurons, adding Cmn to their sequence. "Basically the idea was that when you put this amino acid in the pore of the channel, the bulky side chain entirely blocks the passage of ions through the channel," explains Ji-Yong Kang, a graduate student who works in Wang's group, and first author of the new paper. "Then, when the bond in the amino acid breaks in response to light, the channel is opened up." The method worked in isolated cells: After trial and error, the scientists found the ideal spot in the channel to put Cmn, so that the channel was initially blocked, but opened when light shone on it. They were able to measure the change to the channel's properties by recording the electrical current that flowed through the cells before and after exposure to light. But to apply the technique to living mice, Wang and his colleagues needed to change the animals' genetic code---- the built-in instructions that cells use to produce proteins based on gene sequences. The normal genetic code doesn't contain information on Cmn, so simply injecting Cmn amino acids into mice wouldn't lead to the molecules being integrated into proteins. In the past, the Wang group and others have expanded the genetic codes of isolated cells of simple organisms like bacteria, or yeast, inserting instructions for a new amino acid. But the approach had never been successful in mammals. Through a combination of techniques and new tricks, however, Wang's team was able to provide embryonic mice with the instructions for the new amino acid, Cmn. With the help from Salk Professor Dennis O'Leary and his research associate Daichi Kawaguchi, they then integrated the new Cmn-containing channel into the brains of the developing mice, and showed that by shining light on the brain tissue they could force the channel open, altering patterns of neuron activity. It was not only a first for expanding the genetic code of mammals, but also for protein control. At the surface, the new approach has the same result as optogenetic approaches to studying the brain----neurons are silenced at a precise time in response to light. But Wang's method can now be used to study a whole cadre of different proteins in neurons. Aside from being used to open and close channels or pores that let ions flow in and out of brain cells, Cmn could be used to optically regulate protein modifications and protein-protein interactions. "We can pinpoint exactly which protein, or even which part of a protein, is crucial for the functioning of targeted neurons," says Wang. "If you want to study something like the mechanism of memory formation, it's not always just a matter of finding what neurons are responsible, but what molecules within those neurons are critical." Earlier this year, President Obama announced the multi-billion dollar Brain Research through Advancing Innovative Neurotechnologies (BRAIN) Initiative, a ten-year project to map the activity of the human brain. Creating new ways to study the molecules in the brain, such as using light-responsive amino acids to study neuronal proteins, will be key to moving forward on this initiative and similar efforts to understand the brain, says Wang. His lab is now working to develop ways to not only activate proteins, but inactive them using light-sensitive amino acids, and applying the technique to proteins other than Kir2.1.